2005 Chrysler Pacifica - I will stick to American made cars from now on! Well I loved delivering newspapers in her, she has a lot of trunk space, especially when the kids aren't riding I can Let the back seats fold down and fill her up to go on my route, so that was always fun, making money with my car! The things I loved about this vehicle, at one point in time would be the interior space of the vehicle. I have always loved going on trips and I have a husband and two small children so we need plenty of room that's what originally made this car appealing to us. That's crazy as I am typing it is hard to think of "pros", I am ready to get to the "cons" its more of those than "pros", that should tell you something there. Lets see, the trunk is a very large size they made the trunk bigger in the 2005 edition because it does not include third row seating. SO pretty much those are the only things I like about the vehicle, it has great space, and I have been going the distance in the vehicle it has 190,000 miles, so I guess that's a good life for a car...Maybe. Wow okay! Well I hate the fact that my model of the Pacifica does not have third row seating a much needed future for this type of car, considering it looks like a van anyways. I also hate the fact that the car only does 17mpg come on its not a luxury car they could have given us way more mileage. Another problem is the car has a whole list of mechanical issues, like now I have to unhook the battery sometimes due to the doors locking on their own or the alarm going off on its on. Another issue that I have encountered in the past with this car is the starter going out and having to be replaced. The belt has been replaced more than once, the water pump has had leakage, and I just recently replace the reservoir and thermostat, So this car has a lot of maintenance that you must maintain if you want her to last. Overall the Pacifica is a good vehicle. We have owned it for almost 2 years and had no issues previously. Last month, our alternator went bad, causing some other damage and a $1000 repair bill. Our oil tends to run low (a recurring issue over the vehicle's lifetime), but regular oil changes resolve that problem easily. The vehicle functions adequately and provides enough space for 2 large dogs and a small child (one of the biggest selling points). We take our dogs and child to our family cabin. This is a great family car! I highly recommend this car if you are in the market for a new family car. It drives nice, nothing majorly wrong with it. It is very good on gas. This car is very good in all weather. It is one of the safest cars that you could get in my opinion. 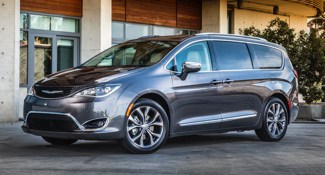 The Pacifica is a very basic car, but it is a amazing. You will not be disappointed at all if you and your family decide to buy this car. If you are not looking into this car, I will just say you should at least give it a test drive. I live in Pennsylvania where it snows a lot. I remember it was one winter day, and I had to go to work. I remember the roads were so bad I didn't think I was even going to get out of my driveway. Three of my other coworkers had called me to see if I was going into work and if I was if I could pick them up as well. To my surprise, my car drive right through the snow with not a single problem. My coworkers and I were all surprised. They were all joking saying they were going to buy a Pacifica as soon as the snow ended. There is a lot of room in this car. It is very good for traveling and sports. This car is amazing in the snow. I live where we get major snowfall, and I have never had a problem getting to where I need to go in the snow. The Pacifica is very good on gas. You would think with it being a big car it would eat right threw gas, but that is not the case for this car. I also like the style and the leather interior of my car. It makes it easy to clean up any messes that there may be. I would say the only con that I have had with this car is with my air conditioning. My air conditioning had stopped working multiple times. I had to finally take it to the dealership where I had originally bought the car from. They said it was something in the line, and it was a mess up when the car was made. To my surprise the company did fix the problem for me with no charge.